Furiends, I hope you had as enjoyable weekend as I did. The human had others over this weekend, and they all showed me, Jacey, and Marley lots of love. They commented on something that the human, Marley, and I already know. Jacey loves to talk. She was talking to them right away, and she did not stop talking even when the humans were doing other things. They got to observe the ritual that the human and I do every morning and evening so that we can check my blood sugar levels and see what kind of insulin dose I need. It was a relatively easy one and I did not fuss because I was eating my noms. For the week, this blood sugar reading and the rest of them averaged 223. That is lower than what we saw last week, when my readings averaged 238. The high reading for the week was 305, and that is above the level where the humans in white coats say it can cause problems over the long term. The low for the week was 71, which was excellent. I am jealous of the diabetic cat that the human’s parents care for. This is around where his blood sugar levels are! Neither the human nor I were surprised with the high reading. You see, it came right after the low reading, and the human did not want to risk giving me too much insulin. A few hours after my shot and my noms, my blood sugar reading was 75. While it is fun to share my blood sugar readings with you, I like to share other amusing things. Today I am going to share with you some advice an adult feline gives to a kitten about another four legged furry creature you humans often bring into your home. 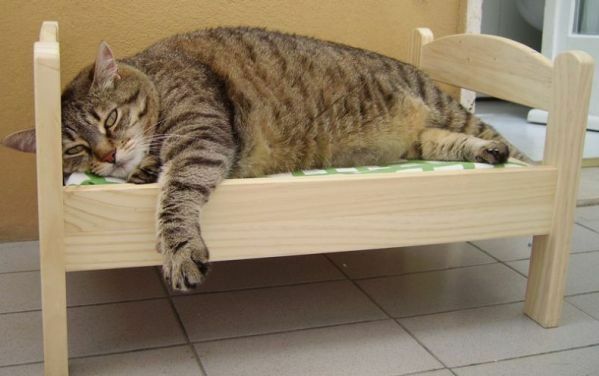 I do not mind canines, but the human tells me that they require much more work to care for than us felines. That is why he does not have one. I am sure that many of you are familiar with Grumpy Cat. 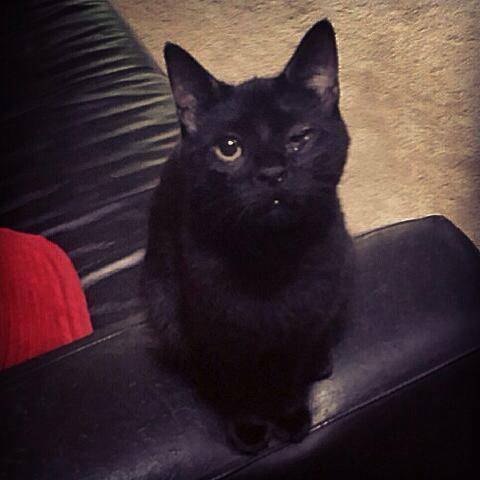 This feline has a face that constantly looks annoyed due to a medical issue. But as you know, most of us felines are happy cats. The human tells me that since today is Friday, many of you humans are very happy today. It is only fitting, then, that I introduce you to the happiest cat in the world! His name is Shironeko, which means “white cat” in Japanese. His humans call him a “zen master cat” for his ability to look like a very happy cat in virtually every possible situation. Look at this picture. I can tell you that in this situation, I would not be pleased because I do not like to be covered. But Shironeko looks like a very happy cat here! Shironeko is so mellow and such a happy cat that he allows his human to put all sorts of things on him and to take pictures of him in unusual positions. I can tell you that I would not allow the human to do these things, and even sweet Jacey, who is a very polite cat, just shook her head at the things that Shironeko tolerates. Shironeko is truly an amazing cat. He can make a bunch of dirty carrots look appealing and comfortable. 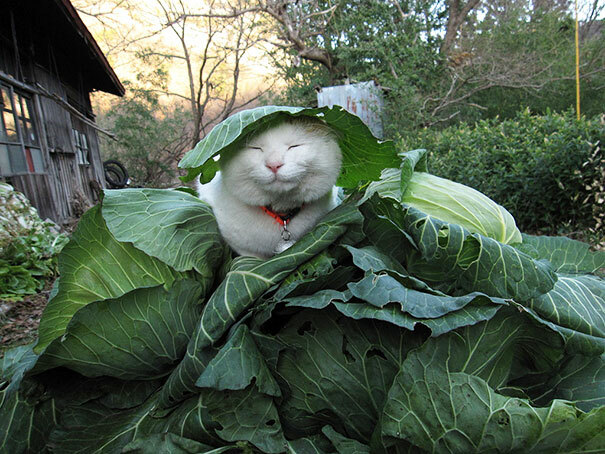 A cabbage patch is not a place where you think felines like me would be comfortable, but as you can see from this picture, he is relaxing there with a smile on his face. If you are interested in seeing more of Shironeko, you can visit his YouTube channel. He also makes appearances on places like I Can Haz Cheezburger. 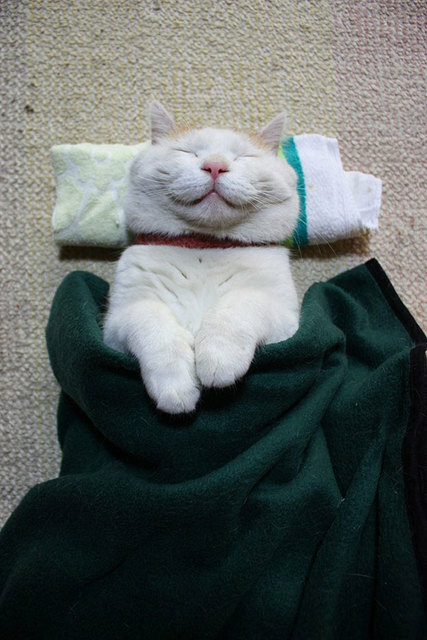 I think we can all learn a few lessons from Shironeko because he is a such a happy cat! There are some people who think that we felines do not miss our humans when they are away for a while. Clearly, they have not been around my home when the human arrives after being away for a while. I will head to the door to give him head bonks. Jacey will run over from her spot to talk to him and get a head scratch. And Marley will immediately start to talk to him from her crate. For special needs cats like me and Batgirl, it is not surprising that we miss our humans when they go away more than other felines do. The human and I have gotten closer since I was diagnosed as a diabetic cat. I have learned that the insulin shots he gives me make me feel better, and I am grateful to him for doing it. He has someone do this for him when he goes away, but I am not as nice to that person since I do not know them. And this is not uncommon. Other humans returning to their felines after some time away reported things like the house being destroyed, a physically sick cat, or a cat who refused to eat noms. So when my fellow special needs cat Batgirl had to go without her human for a while, she did not like it. And Batgirl is not the only special needs cat in that home, because there is another feline with FIV there. Batgirl was happy to see her human was home, but she gave her the stink eye — something we felines are VERY good at — for a while. She did not let her human play with her for a while so that the message she was not happy got across. And then when Batgirl finally decided to play with her human, she decided that she needed to let her human know one last time that she was not happy. 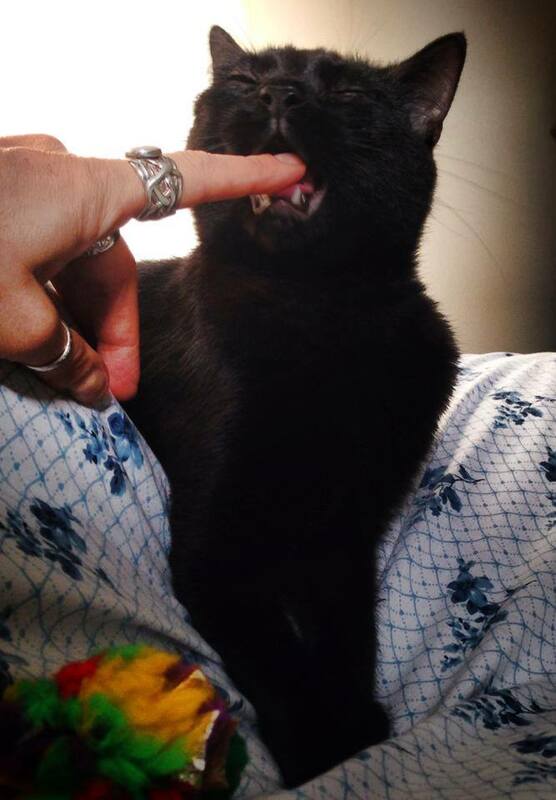 She bit her human’s finger! Do your felines miss you when you go away? How do they react when you come home?